As trade flourished along the Silk Route, so did the production of luxury goods. The design elements on this trunk, a luxury item produced in the city of Wenzhou on China’s south coast, reflect some of the cultural exchanges that occurred as objects traveled over various trade routes. 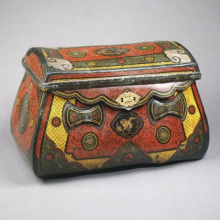 In addition to the dense floral and geometric patterns covering the surface, auspicious animal motifs—such as the circling phoenixes featured on the lid—have also been incorporated. This composite style of ornamentation was not exclusive to either Asian or Islamic culture, but reflects instead a shared aesthetic. Such intricate decoration was achieved using the qiangjin (“engraved gold”) and qiangcai (“engraved color”) techniques developed in China under the Southern Song dynasty (1127–1279). Black lacquer was thickly spread over the coffer’s body, then gold leaf or colored lacquer was applied to designs engraved on the surface. The decorative composition of the container’s lid and side panels recalls compositions inspired by Islamic book decoration and appearing in the art and architecture of the Islamic world. Long before they made icons of Hindu or Buddhist deities, the artists of India created images of gods and goddesses that appear to have been associated with fertility and abundance. The identities of these deities are unknown—it is likely that they were called by many different names—but their representations share several features, most notably well-fed, voluptuous bodies and abundant jewelry. Most of the images of these deities are small, formed from clay, and were probably worshipped on domestic shrines or used as amulets. The female figures far outnumber the male. These clay figurines appear in a wide variety of styles, reflecting differences in the tastes and modeling abilities of various regions and periods. This lively female figure comes from an area of Pakistan where merchants from around the Mediterranean had long maintained trading posts. The area, known in antiquity as Gandhara, developed an unusual hybrid style of art and culture that was at once Hellenic and Indic. 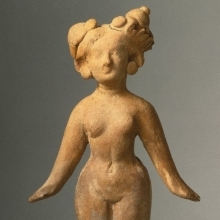 The face and upper torso of this figure resemble those on terracotta images from the classical world, while her wide hips and ornate coiffure are more typical of Indian fertility goddesses. The Sukhothai Period (1250–1378) was a great period of Thai sculpture, when a national style emerged. 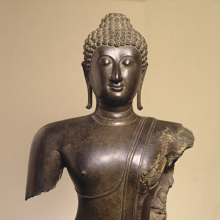 This is evidenced by the heroic proportions of the Sukhothai Buddha torso and head. As an exemplary work of monumental bronze casting, the Buddha eminently demonstrates that statuary made in later periods could be enormously expressive. The expansive chest is covered by a transparent garment covering only the left shoulder. The silhouette is evoked by a few schematic folds of the drapery. The Buddha possesses such features of supernatural anatomy as the ushnisha (cranial protuberance), spiral curls, and extended earlobes, which reflect back to the days before his enlightenment, when he wore heavy earrings as the Indian Prince Siddhartha. Before entering most Japanese Buddhist temples, visitors must pass large and imposing sculptures of ferocious guardian figures whose role is to protect the premises from the enemies of the religion. The aggressive stances and exaggerated facial features of these figures stand in sharp contrast to the calm demeanor of the Buddha enshrined inside. 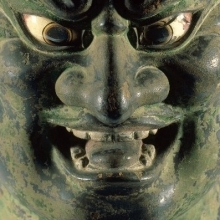 This over-life-size head is from the figure of a guardian king of the Kamakura period (1185–1333). It was once owned by the Kōfuku-ji temple in Nara, and its vitality and naturalism are emblematic of the role of Kōfuku-ji in the brief but pivotal period when the Nara temples were rebuilt and refurbished following a period of political instability. The head is carved from two blocks of wood with a separate topknot. Its rock-crystal eyes are painted on the reverse and inset. Each detail of the physiognomy and headdress is deftly carved and finished with polychrome, presenting an expressive realism. Examination of the interior has revealed graffiti left by the painter. The filigree crown is a later replacement. The Chinese began to produce high-quality blue-and-white porcelains in the fourteenth century, soon after they gained access to cobalt oxide pigment from the Middle East. The cobalt is painted onto the white surface of the porcelain, then covered with glaze that becomes clear when fired, creating what is referred to as “underglaze blue” decoration. Ceramics made in this manner were most popular outside of China and became one of the region’s major exports. Brooklyn’s wine jar is widely considered a masterpiece of blue-and-white porcelain for the deep color of its decoration, its strong contours, and the extraordinary fit of the design of fish and water plants to its form. 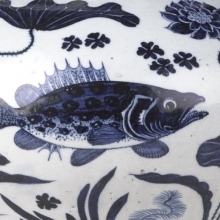 Unlike the designs in other fourteenth-century ceramics, the jar’s decoration of fish swimming among stylized plants fills the entire surface in one unified field, leaving only a small but powerfully drawn band of crashing waves around the neck. The names of the fish form a rebus—a wordplay on a four-character phrase meaning “honest and incorruptible.” While the design might exhort the jar’s owner to upright action, the wine it once contained remained a powerful reminder of life’s temptations. Celadon ceramics of the Koryŏ dynasty (918–1392) are among the most celebrated works of Korean art. Their luminous green color is the result of iron in both the clay and the glaze oxidizing in a reduction kiln. The Brooklyn ewer is a world-famous piece, celebrated for its dynamic naturalistic form, superb glaze color, and meticulous detailing. 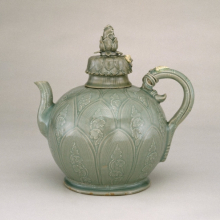 Few surviving Korean celadons can boast such elaborate and delicate carving. The body, lid, and knob of the ewer are all in the form of lotuses, and the handle is a lotus stalk tied at the top with reeds. The cover and handle were originally joined by a chain, now marked by two loops, which are placed where a gold-painted butterfly on the cover would have connected with the insect’s pupa on the handle, both modeled in delicate relief. Dots of white slip accentuate the ornamental motifs, while glaze pools in the deeper carving to create a range of tones on the surface. 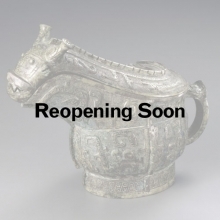 Portions of our galleries for Asian and Islamic art are closed for a major construction and reinstallation project and scheduled to reopen in phases, beginning in 2017. The first phase, Arts of Korea, is now on view. You can also see a selection of Asian and Islamic objects in our Infinite Blue exhibition on the first floor. We house one of America’s foremost collections of Asian art. The Asian galleries, once renovated, will continue to provide a full survey of those holdings, featuring more than 350 works of art from Japan, Korea, China, India, Southeast Asia, and the Himalayas. The collection is home to a diverse array of objects, from glowering Japanese guardian figures to delicate Indian miniature paintings, and from the heavily wrought surface of a Chinese cloisonné altarpiece to the smooth celadon glaze of a Korean ewer. 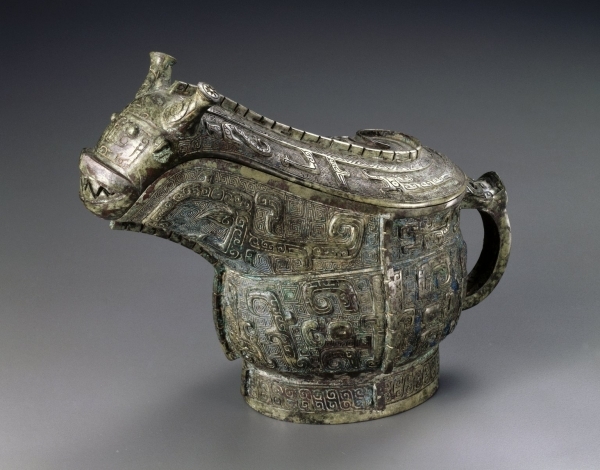 The Chinese collection features objects that range in date from the Neolithic period (circa 3000 B.C.E.) to the present. The works reveal the sophistication of Chinese craftsmanship and the variety of concerns—funerary, courtly, religious, and poetic—that combined to define traditional Chinese culture. They also demonstrate an enduring respect for antiquity, visible in forms derived from ancient bronzes, emblems such as the dragon and the taotie mask, and materials such as jade, all of which were employed by Chinese artists over several centuries. We were one of the first American institutions to collect and exhibit Korean art, and as a result we house one of the country’s premier collections, with varied art forms through which Korea distinguished itself from its neighbors, including a fine selection of ceramics such as early stoneware funerary vessels, inlaid celadons, and later wares with freely painted underglaze decoration. There are also rare examples of bronzes, furniture, and painting. Japanese works form the largest area within our Asian collections. In addition to traditional arts of Japan, they include ceramics by great masters of the twentieth and twenty-first centuries. A portion of the collection is dedicated to the art of the Ainu people of northern Japan, material rarely seen in Western museums. Our outstanding collection of South Asian art includes works from India and surrounding areas. These objects represent the rich religious traditions of southern Asia—Hinduism, Buddhism, Jainism, and Islam—with an emphasis on figural sculpture and architectural elements. Among the strengths of our holdings are terracotta figures dating from prehistory to the present and courtly objects made from precious materials. Southeast Asia and the Himalayas are represented by several noteworthy objects, including large-scale sculptures from Cambodia and Thailand and early images from Kashmir and Nepal. Like South Asian traditions, the arts of these areas are primarily religious in subject or inspiration. 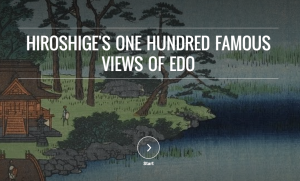 View 118 woodblock prints that illustrate the changing seasons of nineteenth-century Tokyo.